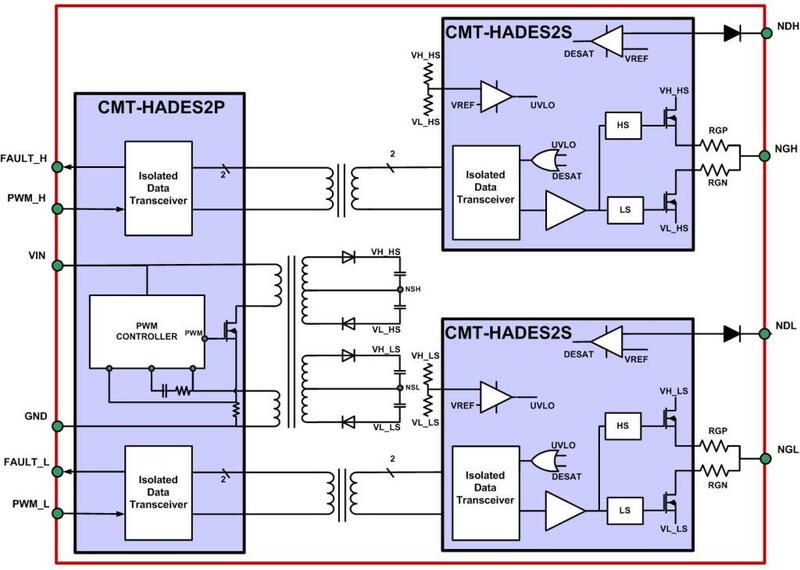 CMT-HADES2P includes a current mode controlled DC-DC flyback converter for the generation of the on-board power supplies and the isolated data transmission from the external control interface to the 2 secondary sides and performs local fault management. CMT-HADES2S includes a push-pull drive capable of sourcing/sinking up to 12A each and multiple protections like under-voltage lockout (UVLO), desaturation detection, Active Miller Clamping, over-temperature sensing. It also includes the isolation interface to primary function. 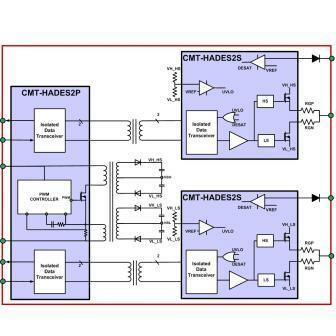 A half bridge high voltage isolated gate driver includes 1 CMT-HADES2P, impementing an isolated Flyback DC-DC converter, and 2 CMT-HADES2S, driving the low- and high-side power transistors. An evaluation kit EVK-HADES1210 implementing a high-temperature isolated gate driver based on CHT-HADES2P and CHT-HADES2S (225°C, ceramic package) is available from Cissoid. If you need support for your high temperature power supply or motor drive design, just contact Cissoid.